Thought this painting would be an excellent representation of our weather this afternoon and tomorrow. A LOW PRESSURE SYSTEM WILL STRENGTHEN RAPIDLY AS IT MOVES FROM THE SOUTHERN PLAINS TO THE GREAT LAKES TODAY THROUGH SUNDAY. STRONG WINDS WILL DEVELOP ACROSS THE REGION. ..ESPECIALLY TONIGHT...WHEN WIND GUSTS TO 40 MPH ARE POSSIBLE ACROSS MIDDLE TENNESSEE. DRIVERS SHOULD USE EXTRA CAUTION IN THE WINDY CONDITIONS. ALSO...OUTDOOR OBJECTS SUCH AS CHRISTMAS DECORATIONS SHOULD BE SECURED. A LAKE WIND ADVISORY INDICATES THAT WINDS WILL CAUSE ROUGH CHOP ON AREA LAKES. SMALL BOATS WILL BE ESPECIALLY PRONE TO CAPSIZING. On December 22, 1989...Temperature at Clarksville drops to -12, tying the record low for the month. Nashville breaks its monthly record with a reading of -10. Crossville's -8 degrees sets a new daily mark. On December 22, 1990...Winchester records its greatest one-day rainfall ever, with 7.52". 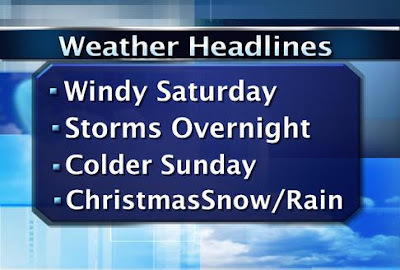 Use the links to the right to see Our Latest, Local Forecast and other discussions about the current weather situation. 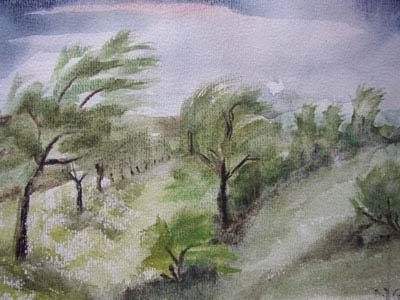 Try 'Windy'...I think that is where I found it via Google images....it is a foreign painter.